Design Identity is a firm that desires to help churches and independent retailers bring their bookstore and cafe visions to reality. We strive to create an extraordinary retail atmosphere that gives our clients innovatively designed stores that are unique, communicates our client's values, provides a pleasurable shopping experience and performs to expectations. We provide Solutions for Retail and Cafe development. 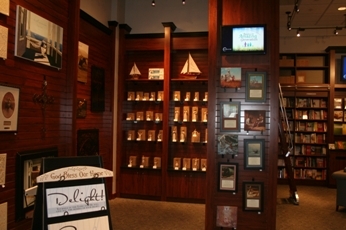 Our passion and focus is to serve you as we help design, implement and manage your unique bookstore and cafe. With over twenty years of professional retail expertise, we are able to offer solutions to churches and independent retailers in every step of the way that facilitates the store development process. Together we will journey though all the phases of design, construction, as well as the implementation of fixtures, cafe equipment and technological services. So that you are fully prepared for grand opening day, we are pleased to offer "Retail Essentials". Retail Essentials is, in short, a comprehensive training module covering retail and cafe operations, staff training and inventory management. Let's get started on the process today! Simply give us a call or contact us and we can schedule a time for a complimentary design review. Thank you for taking the time to visit our site. We would love the opportunity to talk with you about your needs! COPYRIGHTS 2008 DESIGN IDENTITY. ALL RIGHTS RESERVED.